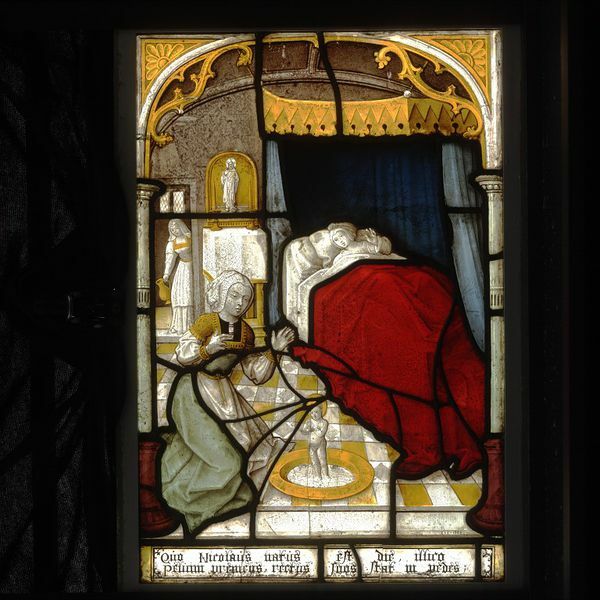 This stained-glass panel is from a series depicting scenes from the life of St Nicholas. The donor was Nicolaas Ruterius, Bishop of Arras 1501–9, who was previously a priest in Louvain. The panels were originally installed in the Great Cloister of the Charterhouse of Louvain. It was very common in the Middle Ages for people to have a particular devotion to the saint after whom they were named. St Nicholas was the model for Father Christmas and Santa Claus. His legend relates that he was the son of wealthy parents who lived a pious Christian life. When they died, Nicholas distributed his wealth to those in need. Because of these acts of charity and gift-giving, he became the beloved figure known in all Christian countries as the bringer of gifts to good children. This legendary prototype of Santa Claus was in fact a bishop of Myra, in Turkey, in the first decades of the 4th century. He probably attended the first church council, called by the Emperor Constantine, at Nicaea in 325. He died in 345 or 352 and was apparently buried in the church at Myra. The veneration of Nicholas developed early on in the eastern lands of Turkey and Greece. By the 10th century he was venerated by the emperors in Germany. In the 1070s invaders known as the Seljuk Turks overran Myra and the surrounding lands. Sea merchants from Italy took advantage of this chaotic situation and appropriated the bones from the monks who were guarding them. In 1087 the relics arrived in the Italian town of Bari, where they still remain. Pilgrims still visit the tomb of St Nicholas and miracles have been recorded as taking place there. The Charterhouse in Louvain, a monastery of the Carthusian Order, was founded at the end of the 15th century by the dukes of Burgundy. It was financed with donations from ducal family members, as well as from clerics of the surrounding areas, such as Nicolaas Ruterius, and from local residents. In the centre of the panel, towards the right, is a poster bed with a deep yellow tester and blue drapes pulled back to reveal a young woman, painted on clear glass, lying in a bed covered with a rich red bedspread. Her left hand is raised and she looks towards a scene depicted in the foreground. A female servant, a midwife, dressed in a green gown with a deep orange bodice over a white shirt and a long white apron tied at the waist, kneels with hands raised on a yellow and white chequered floor. She is looking at a baby, nimbed, standing in a small amount of liquid in a deep orange basin. Next to the bed is a small cabinet covered with a white cloth with orange trim on top of which are two orange candlesticks with long tapered orange candles. These are placed in front of a small arched shrine, in orange, which houses the image of a male saint, in white glass, with a cruciform halo and carrying a globe surmounted by a cross - a figure of Christ. To the left of the shrine there is an open doorway which leads to a chamber with a mullioned stone window inset with two small clear quarried-glass lights. Another female servant, wearing a white gown and overskirt trimmed in orange, peers through the doorway at the scene in the foreground. She holds an orange-coloured footed jug by its handle. The whole is encased in a round archway and there is an inscription at the base. On the day Nicholas was born he stood up on his feet in that very basin he was being washed in. 211-213-1908 were bought from the stained glass dealer, Grovesnor Thomas. He informed the museum in 1913 that they had been bought by Sir Peter Neave in the marketplace in Rouen about 1820. At the time it was known that they were of Flemish manufacture but it was believed they had been installed in a church in Rouen. Grosvenor Thomas bought the panels from Sir Thomas Neave, Baronet, of Dagnam Park in Essex. The Neaves donated panels for a window in St Mary's Church, Prittlewell. These are said to have come from the same source. The Charterhouse in Louvain was a monastery of the Carthusian Order founded at the end of the 15th century by the Dukes of Burgundy. It was financed with donations from the ducal family members as well as from clerics of the surrounding areas and local residents. Records indicate that the cloister glazing was paid for by members of the Gillis family from Louvain. The glazier was Hendrik van Diependale and his son Jan. The work probably began early in the 16th century and carried on to the middle of the century. A 19th century drawing of the cloister windows indicates that there were 80 windows of two lights each, surmounted by a single quatrefoil-shaped panel. The composition of each window seems to be three prophet panels surmounting four narrative panels. If this is correct, then there would originally have been 210 prophet panels and 320 narrative panels in the cloister glazing. The theme of the cloister glazing centred on the Fall and Redemption of Mankind through the life and death of Christ. There would have been scenes from the New Testament paired with their Old Testament prefigurements. Panels depicting saints and donors would have accompanied these scenes, probably occupying the lowest registers of the windows. Additionally, prophets announcing these events would have been included in the upper portions of the windows. Nicholass Ruterius (Nicolas de Ruistre) was Bishop of Arras from 1501 until his death in 1509. He set up a college for pupils from Arras in the University of Louvain. He also endowed a cell at the south-west corner of the Great Cloister of the Charterhouse of Louvain and paid for four windows adjacent to the cell. These were dedicated to the life of his name saint, St Nicholas. His shield, which formed part of this decorative scheme, shows the three vine leaves of his family quartered with the arms of the bishopric of Arras. This consists of two crosiers addorsed with running rats in bordure. It has a crest of mitre and crosier flanked by his initials. Below was his motto. Nicolaas Ruterius donated eight panels for the cloister glazing scheme. This panel which was one of six depicting scenes from the life of St Nicholas, his patron saint, one with a long inscription that seems not to have survived, and a panel depicting his coat of arms which is also in the museum (2633-1855). These eight panels originally occupied two windows in the cloister wall opposite the cell built and endowed by Nicolass in 1507.